Date: on the afternoon of Saturday November 22, 2014. We stopped at several locations in Altos but the photos of the bird in question came from near Parque de Siena. (I think that is what it is called.) We walked towards a building that I think is a library and then beyond to the first house and turned away from the house looking across the street into the habitat. My guess is that we were facing north, but I may not be correct! Description: that it had a plain, not streaky, breast, a white eye-ring, a dark streak in the eye, paler above the eye and a pink mandible and dark maxilla. I especially thought the head looked a bit flat. I thought I should take photos and had trouble getting on the right bird as it was crouching low in the grass and was hard to distinguish from the grassquits in my view finder due to the poor lighting. I took ten photos before we decided to move on to another location. One photo I have included shows a very scruffy looking bird I assume to be a molting grassquit along with another hidden female-type grassquit and the sparrow in proximity so you can compare size. 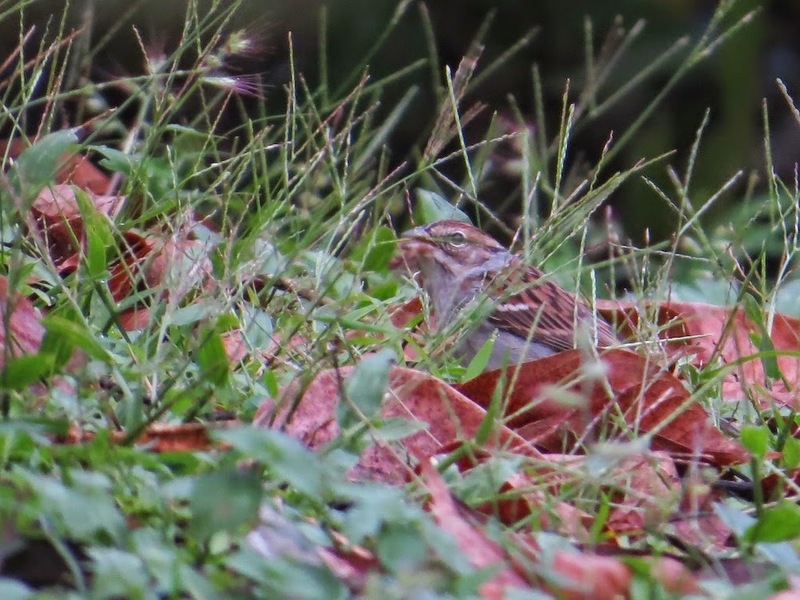 In one photo you already have, I also notice a white line in the wing which could indicate Chipping Sparrow. I think one of my companions commented on that at the time. Maybe I just remember noticing it on the LCD display when checking the images in the field. Chipping sparrows are quite common in breeding plumage and with young in Indiana and I should be familiar with it but did not recognize this bird as Chipping Sparrow without your comments. Elcira says she felt it was familiar but could not place it either. 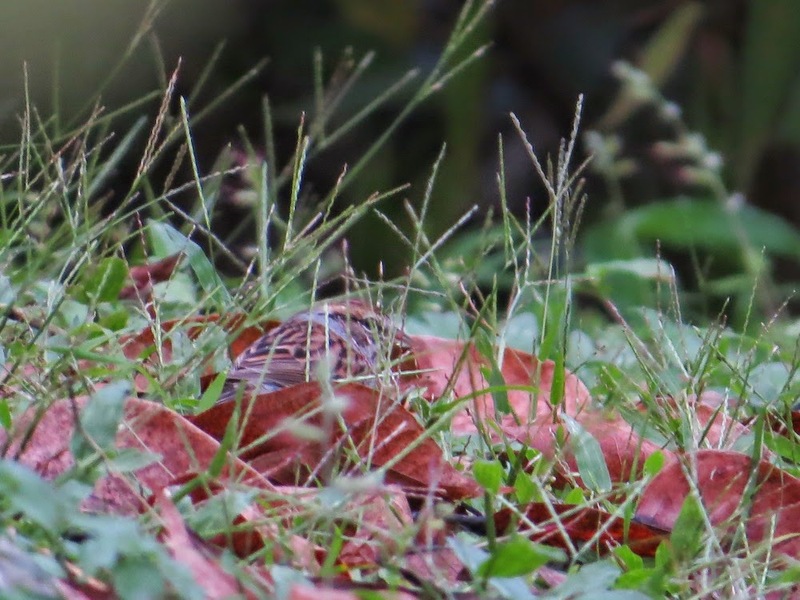 Because of the slightly flattened head I asked Alfred Raab about Grasshopper Sparrow. Grasshopper Sparrow is less familiar to us as we see it less frequently in our area but we have seen it several times. 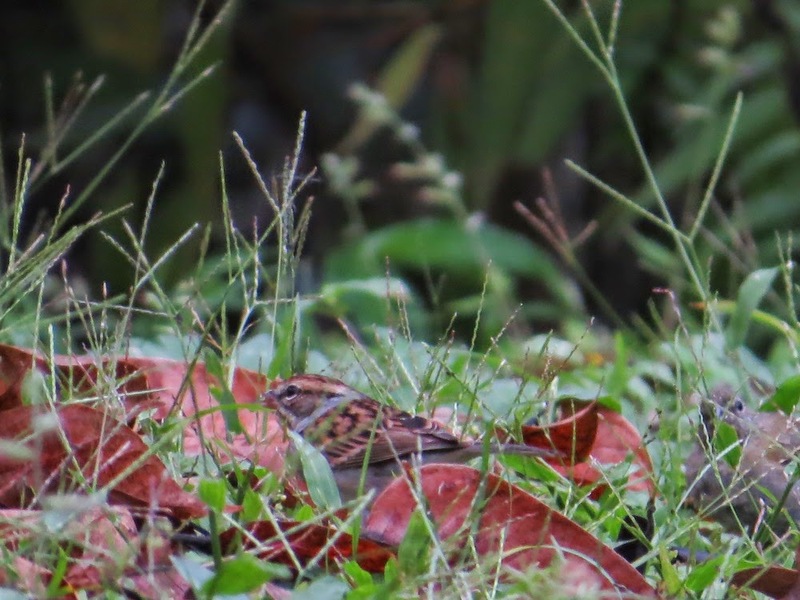 I believe that you are correct that it is most likely a non-breeding adult plumage Chipping Sparrow.